With SAP S/4HANA 1809, you can use an email integration functionality with SAP Cash Application, to fetch payment advices from your inbox and then extract its relevant information with machine learning and computer vision. So far, you had to upload your payment advices manually in the Fiori app Manage Payment Advices. For that, you first had to identify the emails containing payment advice information. You have acquired the license for SAP Cash Application. 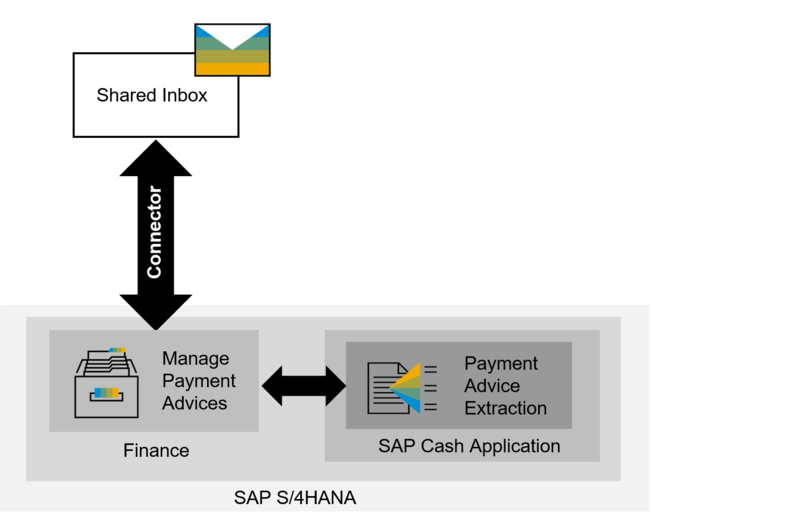 You have enabled the machine learning service Payment Advice Extraction as part of SAP Cash Application on your S/4HANA system (via the customizing activity Enable Machine Learning for Payment Advices). You have access to the oData service <hostname>/sap/opu/odata/sap/FAR_MANAGE_PAYMENT_ADVICES_SRV/PaymentAdviceFileSet/ running on your system. In this example the connector was created in Python, however, you can use other languages as well. The Python library exchangelib is used, to simplify the connection from Python to the Microsoft Exchange Server using the Exchange Web Services (EWS) protocol. In line 37, an infinite loop reads every new e-mail received in the last 60 seconds. In case an e-mail contains an attachment in PDF format, the function upload_attachment is called, to upload the document to the oData service. During the upload_attachment execution, to authenticate against the S/4HANA system, a HEAD request to the oData service is triggered, including x-csrf-token = Fetch and the encoded user and password of the backend system in the format Authorization = Basic <encoded user and password combination> as part of the header (lines 10 – 18). A POST request to the oData service is triggered, including the x-csrf-token received, and a new header attribute called slug in the format companycode=XXXX;filename=YYYY.pdf. This defines the company code and the file name to be used in the S/4HANA system. As a result, the http code 201 indicates that the file was uploaded successfully. Set up a shared inbox for e-mails that include payment advice documents as PDF attachments. Create a generic user for the app Manage Payment Advices, to be the default owner of all e-mails sent to the shared inbox. Follow the steps in the customizing activity Enable E-Mail Integration. Note: The user must be the same used to call the oData service. Send an e-mail with an attached payment advice in PDF format to the shared inbox. The extracted information from the payment advice is displayed in the application. This possibility aims to further automate your process of cash application as part of the order-to-cash scenario in accounts receivable accounting, by reducing one more manual, tedious, and error-prone step. This is not an out-of-the-box solution delivered and supported by SAP. However, it is an example of how to easily enhance your automation journey with SAP Cash Application.